The last week of 2015 started with us still in Suffolk, where we had spent Christmas. After spending the morning alternating between packing and pottering in the garden, we headed back to London in the afternoon. Both Mr Techno and I had Tuesday off. After a week in Suffolk and a week before that being ill, I was missing our familiar green spaces, so Tom and I started the day with a trip to the playground. I then left the boys to it in the afternoon, as my parents had offered to take my sister and I for a festive afternoon tea at Claridges. Which was delicious. And a bit ridiculous. But lovely all the same. Wednesday started windy, as Storm Frank, the latest in a long list of winter storms, was hitting the UK. As usual, we seem to have gotten off extremely lightly in the South, whilst the North is taking yet another battering. My heart goes out to the people trying to cope with more flooding and disruption. Since we had only strong winds, Tom and I headed out onto the Marshes for a morning walk, whilst Mr Techno, sadly, had to go back to work. Tom then took a very long nap, not waking up until almost 4 pm. By that point it was starting to get dark, so we settled for some painting with food dye at home instead. Thursday was New Year’s Eve. Tom and I started the day with a short walk through the woods. After lunch, we headed out for a longer walk over the Marshes, with Tom in the sling. I’ve been struggling to get him into it whilst wearing a bulky winter coat, but have been taking advantage of the mild weather to get it out more often. 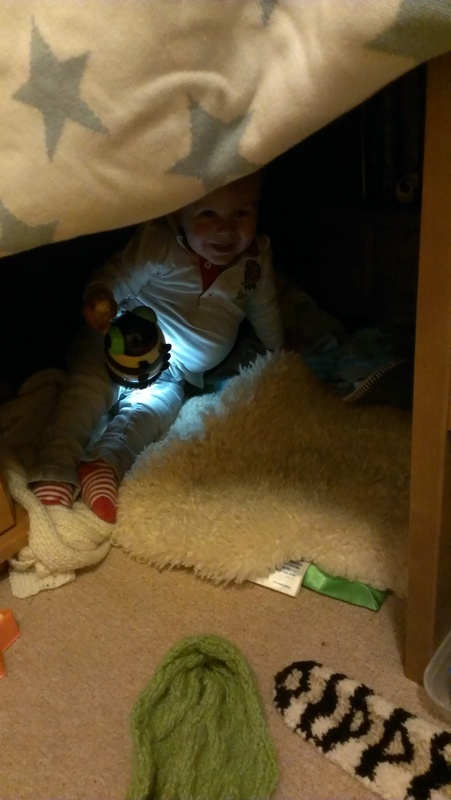 I always notice that Tom is happier to play independently at home on days we use it a lot, which I guess must be down to it being more bonding than the buggy. Tom is very chatty in it as well, with constant exclamations of ‘hiya!’ and pointing at random trees. Friday was the first day of 2016! 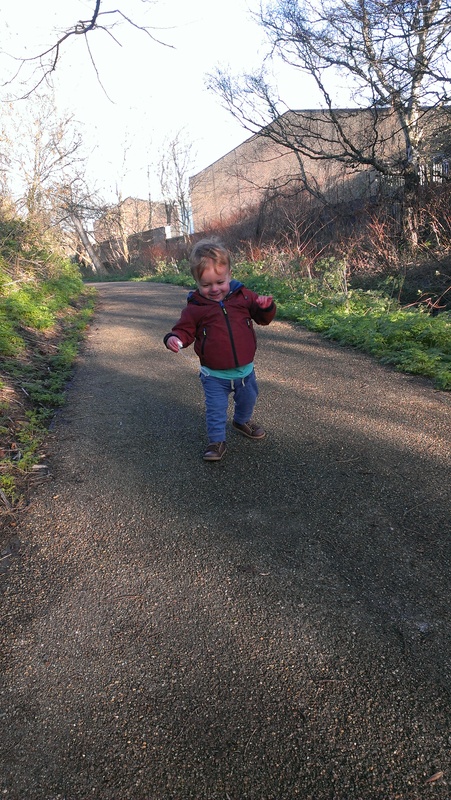 We started well, with a trip to the park to try out Tom’s new wellies. He had a great time splashing around. When we got back to the flat I checked my pockets and realised the little wallet containing my oyster card, front door key, and five pounds was missing. We retraced our steps, but didn’t find them. Mr Techno was at work, but, after a slightly panicked phone call, popped his keys in a cab and sent them round to us. It took about half-an-hour for them to reach us, which we spent exploring the front garden. The space is normally occupied by our neighbour’s scooter, and is where we store the bins, so it’s unusual for us to spend any time there. Tom was occupied for a surprisingly long time, exploring the gravel and looking at the plants, so I suppose the silver lining of getting locked out is that our eyes were opened to the play potential of even the least promising spots. Fortunately the keys arrived just as Tom was beginning to lose interest and get hungry for his lunch. After the morning’s dramas, I didn’t feel much like meeting friends as I had planned to, and had to be in anyway to let Mr Techno in when he got back from work. We spent the afternoon playing with Tom’s trains and chasing each other round the flat instead. The friends were hungover understanding and happy to postpone to Sunday. Saturday started a bit drizzly, but we headed to the park anyway in the hope someone might have found my keys and posted a note on the noticeboard. No such luck sadly so I guess it’ll be a call out to the locksmith when our landlords’ office reopens on Monday (we did call their emergency number when I realised the keys were gone, only to be met with a very unhelpful ‘nothing I can do’. Thank goodness it wasn’t both of us locked out!) Tom enjoyed some more puddles though, so it wasn’t a wasted trip. After all the toing and froing with the keys, I was longing for a proper outing. 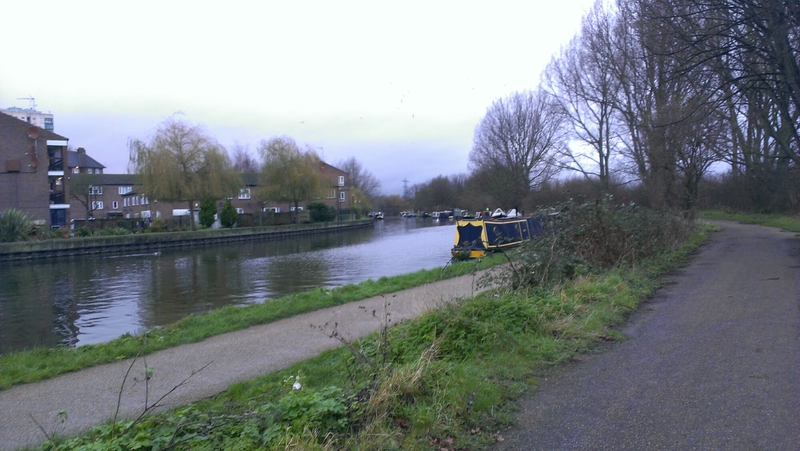 So we headed out for a long walk over Hackney playing fields and along the river to Hackney Wick. Luckily the rain held off until we were almost home, but I still managed to get completely drenched. Tom, on the other hand, was warm and dry in the buggy. Sunday was a day of unrelenting rain. We actually went shopping in the morning – to buy me some new walking boots which was my Xmas present from Mr Techno (much better bought in the January sales!) Can’t wait to try them out. I then headed to Soho in the afternoon to see the friends I had cancelled on on Friday. Meanwhile, Tom and Mr Techno built a blanket fort. Next week we are back to nursery/work and our normal routines. I’m going to miss all this time off!